Written on 13 July 2010 . Accepting henceforth that such an event did occur in some way or another, the story of the Star of Bethlehem raises many questions. What was so special about this star that caused the Magi to interpret it as a sign of any kind, not to mention that it heralded the birth of the King of the Jews? Who were the Magi? Were they located in the east when they first saw the star, or in Palestine when the saw the star rising in the east? Did the star guide them from the east to Bethlehem, or to Bethlehem only from Jerusalem, where they were questioned by Herod? Why did Herod and his office not notice this particularly bright star? thereby recognising some practical aspects of the problem, but ultimately having to resort to divine intervention as an explanation for how such a star could have existed. The latter possibility is not considered here. From Matthew’s account we can deduce that the Magi had not followed the star to either Jerusalem or Bethlehem, but that they were sent to the latter by Herod because of the prophecy that Bethlehem would be the birthplace of the new king of the Jews. This article therefore addresses from a mathematical perspective the physical problem of locating any specific place in Bethlehem by following a star. For argument’s sake we will assume that a particularly bright star did indeed ‘stop’ over Bethlehem and the movement of all observable celestial objects was frozen for that period of time (the rotation of the earth around its axis stopped and its travel around the sun halted). We now need to define in mathematical terms how the Magi could have located Christ’s place of birth by looking upward at the star above them. 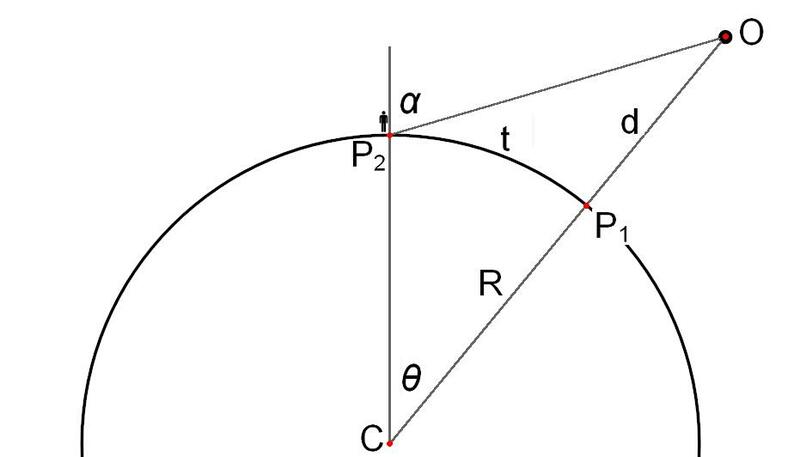 The problem can be depicted as shown in Figure 1, where an object O is located at a distance d from the earth of which the radius is R. The angle θ denotes the angular offset between the object O and a person located at point P2 , as measured from the centre of the earth C. The angle α represents the angle at which this person would observe the object O. At point P1, the point directly below the object O, α = 0°. The distance along the surface of the earth between points P1 and P2 is given by t = Rθ, θ in radians. from which the angle α can now be calculated. In practical terms the angle α defines how accurately one needs to look ‘up’ in order to get within a distance t from point P1. Apart from the sun and the moon, the brightest celestial object in the sky is the planet Venus, also called the Morning Star or Evening Star because of the time of day it is brightest. The minimum distance between the earth and Venus is approximately 38.2 million kilometers (d in Figure 1), while the average distance between Venus and the earth is 41.4 million kilometers . Proxima Centauri, the nearest true star, is about 4.2 light-years (3.97 × 1013 km) from the sun . The average radius of the earth (R in Figure 1) is a mere 6378 km by comparison , which means that whichever celestial object the Magi were following, the simplified equation above can be used for calculations. In terms of the mathematical problem, one now needs to numerically quantify what ‘looking straight up’ would mean, as this presumably was how the Wise Men found the birthplace of Christ. If ‘up’ is defined by a circular area around P1 within which a maximum deviation of 1° from directly above is allowed (α ≤ 1°), it would translate to a circular area of radius t = Rα ≈ 111 km, or 38,700 square kilometers! The maximum width of Israel is 112 km, but through Bethlehem it is only about 85 km, significantly less than what a view angle of 1° would allow. If one would be able to tell what ‘directly above you’ is with an accuracy of 0.1°, the radius reduces to 11.1 km and the surface area to 387 km². For a person to identify a specific venue at point P1, he will probably have to come within 15m of that venue, i.e. t ≤ 15m. In this case one will have to be able to discern what is ‘above you’ with a maximum error of 0.0001° (1.35x10-4°)! Such accuracy will be near impossible to achieve even with the most sophisticated measurement equipment available today. Assuming that it is indeed possible to look upward with an accuracy of 0.0001°, we now need to take into account the practical problem of the rotation of the earth around its axis. As before we will assume that all observable celestial bodies are motionless relative to each other and specifically relative to the earth, which is only allowed to rotate around its axis. 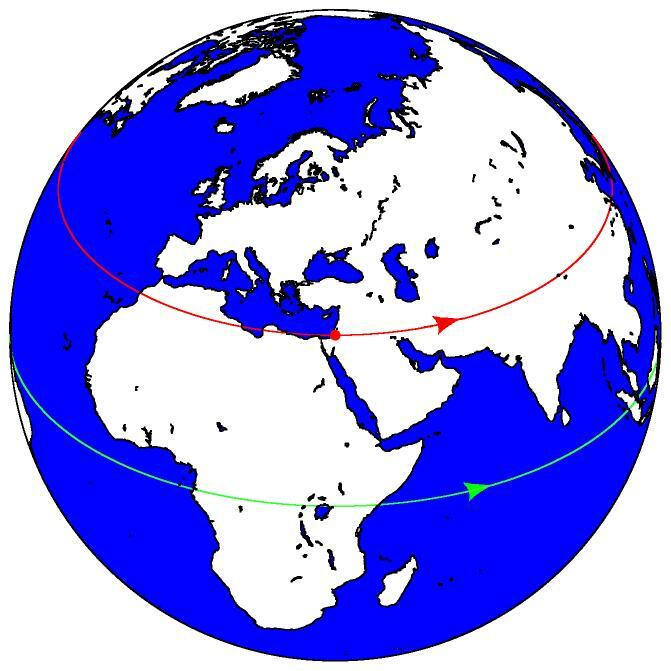 If we were to be looking down at the earth from a star located directly above as shown in Figure 2, Bethlehem would appear in the position of the red dot. As the earth rotates around its axis, we will observe Bethlehem moving along the red trajectory in Figure 2, all the way around until it reaches this same position 24 hours later. The earth rotates at an angular velocity of one revolution per day and a point on the equator will travel a distance of 2πR= 2π (6378) = 40074 km in 24 hours (along the green trajectory in Figure 2), at a speed of 1667 km/h. Bethlehem is located at latitude 31.7°N and will therefore travel a distance of 2πR cos(31.7°) = 34096 km in one day, at a speed of 1421 km/h, or 394.6 m/s (the speed of sound is 340 m/s). This then is the speed at which a person in Bethlehem will move through the spot that is directly below us looking down from the stationary star to the rotating earth. If we allow the spot to have a radius of 15m, corresponding to the upward look angle of ±0.0001° we need to locate the birthplace of Christ, a person will remain within that spot for 2x15/394.6 = 0.076 seconds. The human eye takes about 0.3 to 0.4 seconds to blink, which means that if you are looking up at the star, waiting for the moment that you will be directly below it within 0.0001°, you will miss that moment in less than the blink of an eye. Five seconds later you will have moved almost 2 km past that spot. Conversely, if you want to ‘follow’ the star to the birthplace of Christ, i.e. remain directly below the star all the time, you will have to travel at a speed of 1421 km/h (Mach 1.2), and you will have to step on the brakes rather heavily once you get there! Finally, assuming for the moment that we can indeed look up with an accuracy of 0.0001° and travel faster than the speed of sound to keep up with the star’s projection on earth, we are faced with one more obstacle, the orientation and position of the earth relative to the star at any given moment in time. Whichever ‘star’ it might have been, the problem remains the same. As an example we will assume the Star of Bethlehem to have been the planet Venus, which is also known as the morning or evening star. Venus has essentially been ruled out as a candidate for the Star of Bethlehem because it was and still is a regular sight, which could hardly have been interpreted as a singular event by the Magi . However, Christ is actually referred to as the Morning Star in the New Testament 10, which potentially links him to the star the Wise Men may have followed. As a first step, we must determine whether Venus would ever have passed directly over Bethlehem. 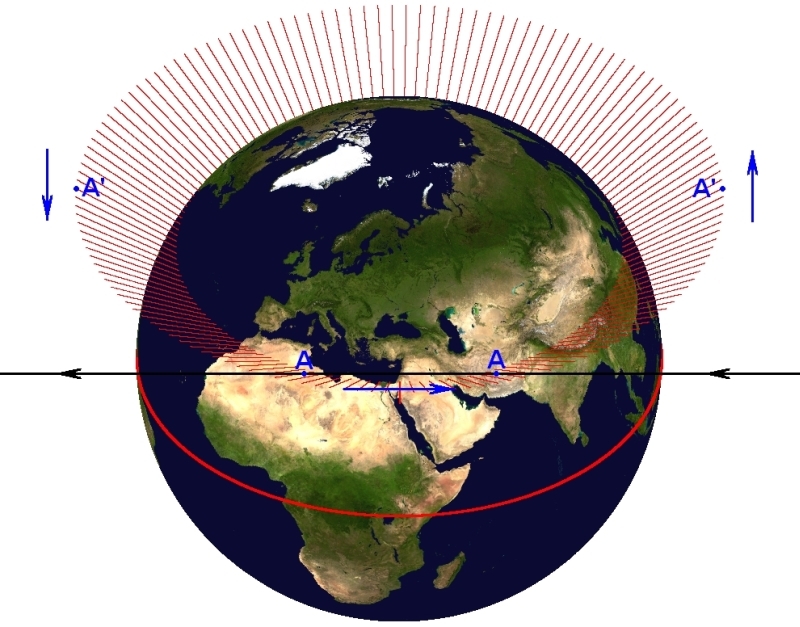 The orbit of the earth around the sun is depicted in Figure 3 and it is important to note the axial tilt angle of 23.4° of the earth with respect to a line perpendicular to its orbital plane (the black line through the planet in Figure 3). 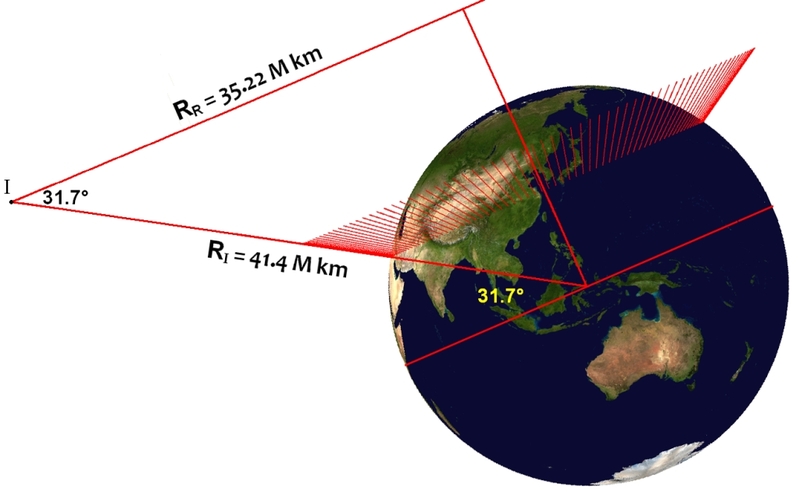 Even though the earth revolves around the sun, the orientation of its rotational axis (the red line in Figure 3) does not change significantly within one year. It does rotate very slowly in space through a process known as axial precession, taking approximately 26 000 years to complete a full revolution . 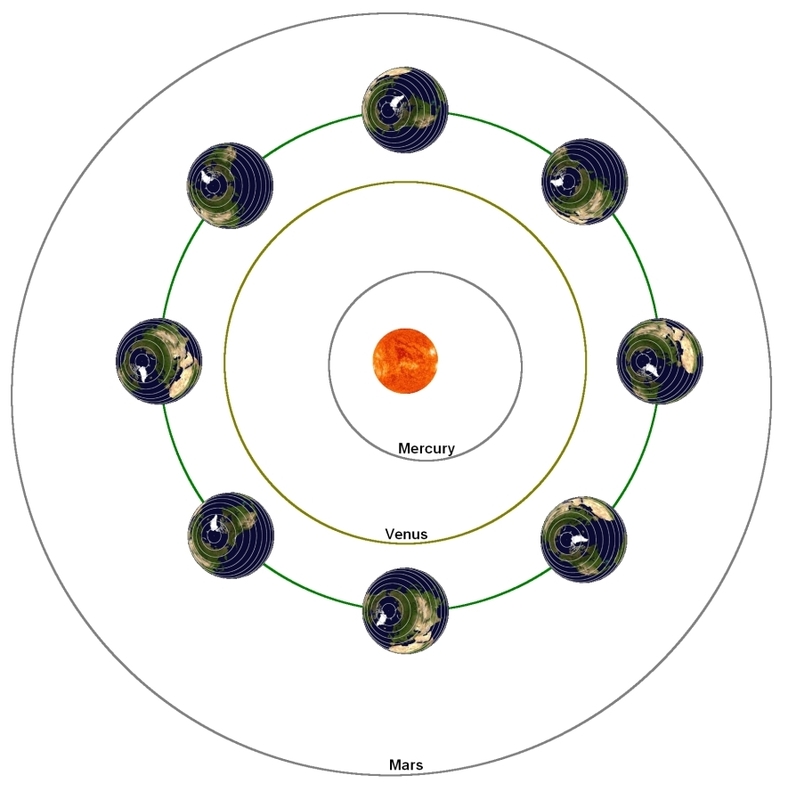 The orbit of the earth around the sun is almost perfectly circular as depicted in Figure 4, with the orbit of Venus essentially also circular and concentric with the orbit of the earth. Note the constant orientation of the rotational axis of the earth as it revolves around the sun (the freezing up of the northern region during winter not depicted). Figure 4. Orbits of the inner planets around the sun. As the earth rotates around its axis, the trajectory of the surface normal of Bethlehem, i.e. the line looking straight up from Bethlehem, will form a cone in space (Figure 5). The red lines depicting this cone are infinitely long, but have been truncated for the purpose of illustration. For any star ever to be directly above Bethlehem, its trajectory in space must cross this cone. The next step is to determine whether the orbit of Venus will ever intersect this imaginary cone in space. The orbits of Venus and the earth both define a circular plane which can be viewed from the side as shown in Figure 6 (Figure 4 shows the view from above). Although the orbits of the earth and Venus are essentially concentric, the plane of Venus is inclined at an angle of 3.39° with respect to the orbital plane of the earth. The radii of the orbits of the earth and Venus are RE = 149.6 million km and RV = 108.2 million km, respectively . The earth and sun are shown out of proportion in Figure 6 in order to illustrate the orientation of the Bethlehem cone with respect to the orbits of Venus and the earth. From Figure 6 it is evident that had the orbit of Venus not been inclined with respect to the orbit of the earth, Venus would never have passed directly (within ±0.0001°) over Bethlehem. As it is, its trajectory intersects the Bethlehem cone C only just at point I in the sector near B. During the remainder of its trajectory Venus will be visible from Bethlehem all the way around to point A and back, but will not appear directly above Bethlehem. Having established that it is theoretically possible for Venus to appear directly over Bethlehem even though for only the briefest part of its journey around the sun, we now have to incorporate the aspect of time into the problem. V= RV x 0.616°/day = 108.2M x 0.616° x π/180 km/day = 1.163 M km/day = 48470 km/h. We have already shown that one needs to look ‘up’ with an accuracy of better than ±0.0001° in order to come within ±15m of the house below the star. If the star happens to be traveling relative to the earth as shown in Figure 7, we now have to define the sector D on the orbit of Venus in which it will be visible from Bethlehem within this required accuracy. With reference to Figure 1, we have seen that the angles α and θ are approximately equal when the distance to the star (d) is very large. This situation is shown in Figure 8, where the red line at B corresponds to the direct overhead position of the star (at Bethlehem), while positions A and C correspond to a distance of 15m to the left and right of B, respectively. A person standing upright at position A will have to look to his right by α = 0.0001° in order to see the Star of Bethlehem when it is located directly above the house. If we think of the angle α as being defined by a narrow tube through which one has to look upward, limiting the view to ±α °, the person at position A will be able to observe Venus from the moment it enters his ±α ° field of view from the left. He will continue to observe Venus through this tube from position A until it has moved to a position directly above point B. In order to follow the star, he then has to move from point A towards his right until he reaches point C, which is 15m to the right of B. Here he will be able to observe Venus for a further 0.0001° to the right, beyond which it can no longer be deemed to be ‘above’ him. From Figure 8 it is therefore clear that ±15m allowable range around the target house translates to a ±2α° (i.e. 4α° total) field of view in which Venus can be regarded as being above Bethlehem. This is indicated by the sector D in Figure 7. The orbits of Earth and Venus are separated by a distance L= RE -RV = 41.4 million km in space, and simple trigonometric calculation for α = 1.35x10-4 ° yields D = 2 tan(2α) L = 390 km. Traveling at a speed of 48470 km/h, Venus will remain visible ‘above’ Bethlehem for a total of 390/48470 = 0.008 hours, or 29 seconds. The orbit of Venus will intersect the Bethlehem cone twice, which means that momentarily ignoring the rotation of the earth, Venus can be in a position directly above Bethlehem for a total of 58 seconds in 584 days! This of course requires Bethlehem to be in exactly the right position the very moment Venus traverses its projected cone, which is practically impossible to happen as explained next. VS = RR x 360°/day = 35.22 M km x 360° x π/180 km/day = 221.3 M km/day = 9.22 M km/h. T=390 / 9.22x106 hours = 0.152 seconds, for 4α. For 2α, corresponding to ±15m discussed earlier, the time will be 0.076 seconds, as expected. To be strictly correct, one needs to take into account the exact point of intersection of the orbits of Venus and the earth. As indicated in Figure 6, the orbit of Venus extends fractionally into the Bethlehem cone. The view from Venus at that furthest point of its orbit is shown in Figure 10. Venus travels through the cone along the trajectory A-A (the actual points of intersection) from right to left at speed V as derived above, while the cone is rotating in the opposite direction at speed VS. The actual speed VA at which Venus will pass through the ‘above Bethlehem’ sector from east to west (as seen from Bethlehem) is therefore VA = V + VS ≈ VS since VS >> V. Should Venus pass through the cone along the trajectory A’- A’, Venus will still appear to be crossing this sector from east to west since VA ≈ VS and Bethlehem has rotated 90° further relative to its position in Figure 10. Finally, one has to take into account the exact orbital positions of Venus and the earth relative to each other at any given moment in time. For Venus to appear ‘above’ Bethlehem at any point, both have to be in the correct position, i.e. Venus must be at the intersection between its orbit and the Bethlehem cone, and the earth must have rotated such that Bethlehem is exactly below Venus at that very moment. The calculation of the actual position and time of appearance of Venus above Bethlehem is a complicated mathematical problem and falls beyond the scope of this article. The reader will however realize the near impossibility of such an alignment of Venus, the earth and Bethlehem ever occurring. The principles applied here for Venus are equally valid for any other star, comet or conjunction of planets to be identified as the Star of Bethlehem. The above mathematical analysis of the concept of following a star clearly demonstrates that whoever wrote the account had no understanding whatsoever of astronomy. one can categorically state that the possibility of the Magi having located the birthplace of Christ by following a star is identically zero. Whatever the reason might have been for the inclusion of the Magi in the story of the birth of Christ, the following of a star had nothing to do with it, i.e. the Magi could never have followed a star to any place in Bethlehem and the Star of Bethlehem therefore never existed. Any attempt to identify a specific star, comet or conjunction of planets as the Star of Bethlehem is therefore a complete and utter waste of time. 1. Matthew 2:1-12, NIV Study Bible. 3. The Infancy Gospel (Protovangelium) of James, Christian Classics Ethereal Library (CCEL[http://www.ccel.org/ccel/schaff/anf08.vii.iv.html]), Early Church Fathers (DVD), ISBN 978-1-931843-13-3, 2009. 4. Mark Kidger, The Star of Bethlehem, An Astronomer’s View, Princeton University Press, 1999. Kidger presents an excellent overview of historical and current views on the topic. The article can be downloaded in PDF format (1MB) here.